Check out Geri X's excellent introduction to the Kamry K1000 E-Pipe Kit! This is a great looking kit that's super easy to use! 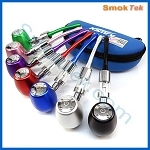 It is available in several colors with an anodized finish, making the K1000 E-Pipe practically smudge-proof. With its 510 connection, this unit is compatible with many devices on the market, and looks fantastic with the Aspire Nautilus Mini or the iClear 16 (and many more!) In the video below, Geri X shows a hassle-free way of attaching your device onto the K1000 E-pipe - and more!